Wikipedia has chosen to temporarily hide its Italian edition due to the prospect of new speech restrictions in Italy. A law proposal from prime ministry Berlusconi known as “DDL intercettazioni ”, or Wiretapping Act, is currently being debated in Italian Parliament. 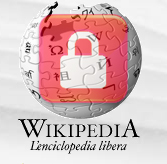 Wikipedia users believe the new restrictions are an affront to everything the free and neutral encyclopedia stands for, and the Italian site could be permanently deleted if the Parliament approves the proposal. Those traveling to the Wikipedia Italian front page were greeted with a message explaining the new Italian wiretapping proposal and the reasons why the Italian site was shut down. Paragraph 29 in “DDL intercettazioni” states that all website have the obligation of publishing a correction any content, or comment which is deemed by an applicant to hurt his or her image. The Wikipedia message points out that the freedoms are further restricted because the law does not require a correction to be evaluated by an impartial third judge. Anyone who feels offended by blog posts, news articles and by pages on Wikipedia can call for the content to be corrected—and it must within 48 hours or face hefty fines. It’s also worth noting that defamation of character is already covered by Article 595 of the Criminal Code in Italy.